Note : This series MUST be read in order. Start with More Than This and progress from there. I love words. I’m working towards a career in them because I just love words so much. But I am struggling here, right now, to piece together the right words to describe just how… inspiring Jay McLean’s work is. I have read everything Jay McLean has published. I think it’s safe to say she is one of my very favorite Authors. With each new release I find myself loving her work that much more. Swear, no other Author has managed to give me all the feels like Jay McLean does. I have laughed and cried through each of these More books. I’m not kidding. The emotions these characters provoke in me causes a swelling sensation in my chest, it feels like it will burst out of me if I don’t release it some how.. generally by crying and laughing at the same time – the overwhelming emotions make me look nutty, but its unavoidable with this series. That is how I have felt with each one of these More books. They were my first experience of Jay McLean’s writing (one year ago this month I dipped into More Than This), and honestly, the More gang are my most favorite as well. They have stayed with me always. Reading the final book in a series is always bitter-sweet. Wanting to know how everything pans out, and everyone getting their happy endings. At the same time, wanting more.. but all great things must come to an end. 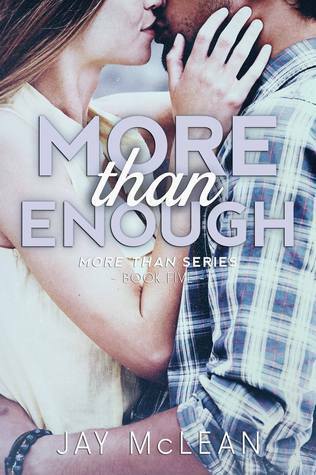 More Than Enough was our ending. The best bit is that it felt finished. I put down this book satisfied and happy, not longing. Jay McLean has yet again bought to life characters who show strength, growth, loyalty and flaws. So relatable, and so honest. Dylan is the embodiment of strength, courage and love. He broke my heart in this book. I actually felt it tear down the middle. His humor surprised me and made me fall for him that much faster. He is so funny! I love that he was such a.. surprise. Given the silence that surrounded him in the previous books I really had no idea what to expect, and Jay blew me away yet again with this astounding male character who was so broken, yet so.. beautiful. His girl was exactly who she needed to be. The perfect combination of two people, each wrapped in a cloud of grief, coming together to hold each other up. It was amazing to watch – or read I suppose – our heroine was perfect for Dylan. The love they have for each other was so true and so strong it filled me with hope. But that is a common emotion with all Jays books for me. Every page is full of hope and I love that SO much! If you haven’t read these books yet, then you’re truly missing out. I suggest you go to Amazon like, RIGHT FIRETRUCKING NOW and pick the whole lot of them up. These books have the ability to change your perception on all things. They showed me compassion, love, friendship, loyalty, grief, the list goes on.. Honestly, I highly, highly recommend them. The talent that Jay McLean shares with her readers is just… inspiring. I want to experience friendship like the More Than gang. Love like them, be loved like them, and I kind of wish I was Lucy (by far my favorite female character in ALL books, ever). But above all, this whole series has gripped my heart from the beginning, I have shed more tears and laughed until I cried more times than I can count with the More gang. I have so much thanks for being able to experience the lives of these characters. More Than Enough was the perfect, bitter-sweet finale to all 5 of these amazing journeys. I have no doubt I will be rereading this series several times. I also have no doubt that this will remain my favorite series. I am in awe of your talent Jay McLean. Thank you, so much, for sharing it with us. I looooooove these books as well!!! Seriously just want to sit and read them all over! I am a bit confused at Riley’s letter to Davey at the end?? what are your thoughts? You know it has been too long since I read them, I’ll do a re-read (since the series is my favourite) and get back to you. Thanks for your comment!